Just because the weather has gotten a little colder doesn’t mean it’s time to bundle up on the couch and hibernate until spring. Quite the contrary. This is the best season to go out and explore the best hiking, camping, and overall outdoorsmen-approved activities that the tristate has to offer. (Bonus: Most of the places will be far easier to explore without the usual warm-weather crowds). We rounded up some of the best fall camping from the Garden State to the Finger Lakes, then mapped out the most scenic route to your destination -- that way you won’t miss a second of fall foliage along the way. The Camping: If you’re not cozying up to a massive fire pit at some point this fall, you’ve done the season wrong. And at Firelight Camps, you won’t have to spend hours collecting firewood to make it happen. 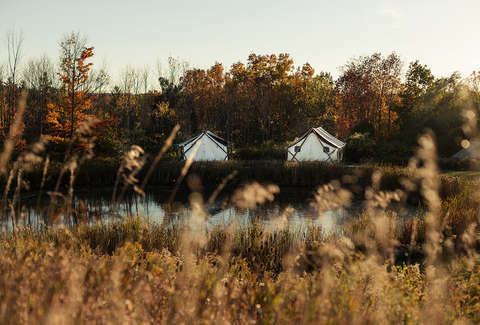 This campsite, located on the grounds of the swanky La Tourelle Resort and Spa in Ithaca, is glamping at its finest -- offering everything from massages in your tent to a nightly happy hour around their communal fire pit. Inside, there are hardwood floors and plush bedding -- in some options, they even supply heaters if the weather gets chilly. When you’re not taking in the fall colors around the campsite (there is a direct connection to the hiking trails of Buttermilk Falls State Park on site), tour some local Cayuga Lake wineries or sip on handcrafted hard cider -- fall’s perfect compliment. The Route: Once out of Manhattan, I-80 will take you through the Delaware Water Gap and Pocono Mountains in Pennsylvania before reaching Route 17 to head into the Ithaca and Finger Lakes region. The Camping: Speaking of Route 17, you don’t have to travel on the major highway very far to see some superior autumn sights. 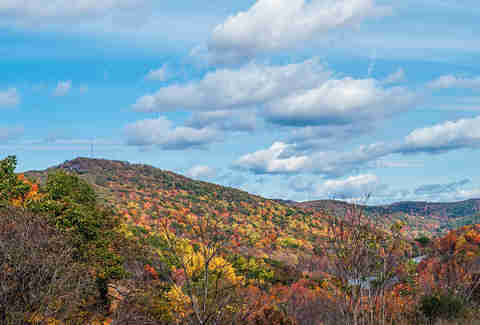 The Hudson Valley is the epitome of fall beauty, thanks to places like Harriman State Park. It’s the second largest in the NYS park system, and home to 200 miles of hiking trails and a whopping 31 lakes. 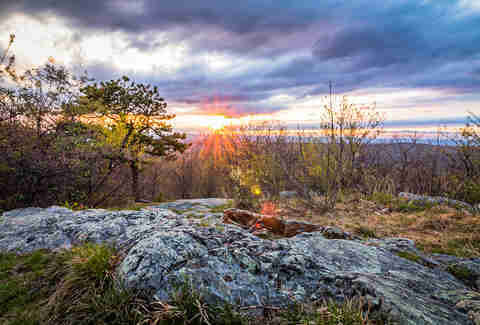 But it gets better: Camping at Harriman’s lean-to sites is completely free. There are nine such sites, each with a three-sided stone cabin and two fireplaces inside to keep you warm on chilly fall nights. There are no reservations to make, but the lean-tos are first come, first served, and communal. If you’re not into that, there are rustic cabins available to reserve at the Sebago Cabins camp, or “pioneer style” (meaning, you pitch a tent and that’s it) at Lake Tiorati, Cedar Pond Camp, or Tiorati Plateau. Once you’re settled, set off hiking along the Appalachian Trail, and see the Manhattan skyline from a good 40 miles away. The Route: Once outside the city and into NJ, you’ll follow NY-17, a historical route (and the longest state route in New York) straight through the center of the State Park, including charming villages like Tuxedo, Harriman, and Sloatsburg. The Camping: Here’s a little secret about tri-state beach towns: They’re always better to visit in the fall. Sure, you may not have sunbathing temps, but you’ll have the beach all to yourself (not to mention the bars, restaurants, and local trails). Locals will be nicer to you. You could even luck out and snag the last few sufficiently warm beach days of the year. At Cedar Point County Park, your campsite will be right on Gardiner’s Bay, walking distance to the historic lighthouse, and about 20 minutes to the town of East Hampton proper. At the county park, you can rent a rowboat, birdwatch, hike, fish, and enjoy some true peace and quiet. The Route: Once out of Queens, take the (slightly longer) Southern State Parkway route to pass through five forested areas: Hempstead Lake State Park, Massapequa Preserve, Belmont Lake State Park, Connetquot River State Park, and the Wertheim National Wildlife Refuge. The Camping: While the most popular camping in the Pine Barrens happens in Wharton State Forest, the true “Pine Barrens” area spans 1.1 million acres (yes, million) across 22% of the state -- so you’re far from short of potential options. Some of the most popular sites are along the Mullica and Batsto Rivers, most easily accessible by kayak or canoe (but hiking is doable also). In the fall, this region of the Garden State is flush with cranberries and at the annual Cranberry Festival in October, you’ll find artisans inspired by the harvest making everything from jam to beer to jams (of the musical variety) out of the stuff. Just keep an eye out for the Jersey Devil -- this is his stomping ground, especially once the weather gets cold. The Route: As one of the most accessible routes, the easiest way is a straight shot down I-95, but it’s not the prettiest. If you’re willing to tack on some time for the scenic route, take the Garden State Parkway South to local route 539 -- you’ll pass through cranberry bogs and cut through the Pine Barrens. The Camping: Once Labor Day weekend rolls around, we all start to have a greater appreciation for all things spooky. 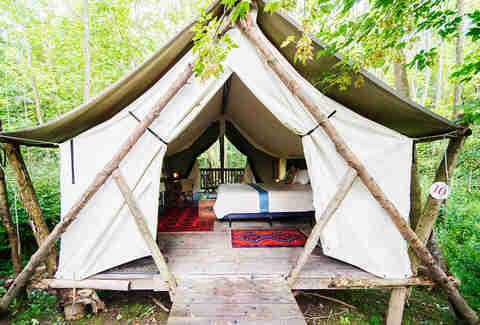 At this campsite, you shack up in a luxe tent at an abandoned zoo in the middle of the Catskills. While that may sound like the setting of a horror movie, each site was specifically chosen to be nestled into a secluded area of the 100-acre property, some overlooking the nearby meadow. When you’re not enjoying the camp (which have queen-size cots and wood-burning stoves) you can hike the wooded trails, or explore what remains of the abandoned zoo… if you dare. The Route: Take I-87 out of the city, but if you can shoot over to Route 9 at some point, do it. You’ll follow the Hudson River north up to the Catskills, crossing through some of the prettiest fall countryside in the area, including Tarrytown, notorious for autumn scenery and occult legends. 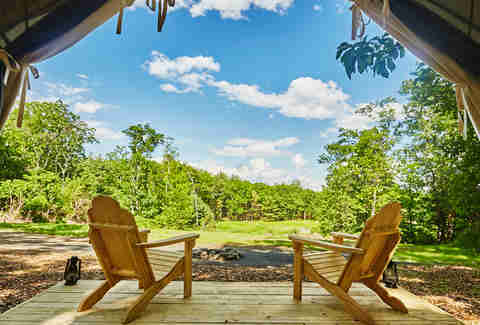 The Camping: Want to see why New Jersey is called the Garden State? Climb to the top of Sunrise Mountain in Stokes State Forest. From this 1,653-foot peak, you’ll see pastoral farmlands, untouched forest, and Appalachian Mountain ridges. In the fall, that means panoramic views of one of the most scenic spots in Springsteen country. The camping here accommodates hikers for sure, with inexpensive pet-friendly and group campsites, as well as cabins and lean-tos with wood stoves to keep you cozy. After climbing Sunrise Mountain, you can take in an evergreen forest at the Tillman Reserve, see the Buttermilk Falls, or travel through the Delaware Water Gap for even more Instagram-worthy views. The Route: Once out of the New York City/Newark area, you’re headed on Route 15 -- a 20-mile stretch of highway through some of that pastoral farmland we discussed earlier, with plenty of open road and hillside along the way. The Camping: Fall at the Jersey Shore comes a bit later than the northern parts of the state (thanks to the summer-warmed Atlantic Ocean keeping things from getting too chilly at night) -- so this is the place to head if you procrastinated on those autumn plans. Cabins here are open through December 31, sleep four, and come with a wood stove, two double bunks, fire ring, and picnic table. 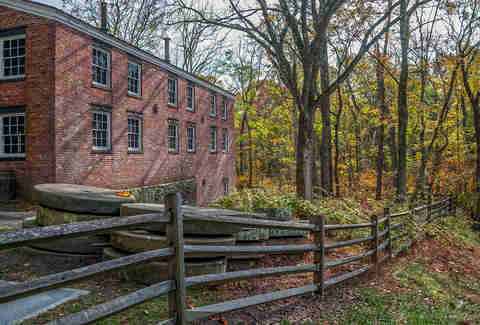 We recommend coming in late October though, as Allaire State Park is home to an old abandoned 19th century iron-making town that gives off real creepy vibes after Columbus Day -- thanks to events like Edgar Allen Poe reenactments in the historic chapel, or haunted hayrides during Halloween weekend. It’s also close to nearby Asbury Park, with plenty of bars and restaurant options if the fire ring isn’t doing it for you. Mornings hiking through the park’s 200 species of wildflowers, trees and plants, or a canoe down the Manasquan River are other options worth exploring. The Route: Once out of the city and Northern New Jersey, the Garden State Parkway is tree-lined, making it a pretty sight in the fall. If you want an even more scenic (and slightly longer) route, cross over to Route 35 and head through towns like Red Bank and Neptune before traveling west to Allaire -- there are plenty of restaurants and an active downtown vibe along the way. The Camping: One of the top reasons to visit the Catskills in the fall -- besides how pretty it is -- is that it’s so close. But, how many of us actually have the space to store camping gear in our tiny apartments?? Enter: Blue Mountain. Located near Kaaterskill Falls and with plenty of hiking through the the Catskill Mountains Preserve trails, this campground rents out tents for just $25 a night -- which is way cheaper than leasing a storage unit. After you set up camp, you can also head out and explore several Catskill towns, like America’s First Art Colony (Palenville, NY), or antique in Downtown Saugerties. The Route: Getting to Blue Mountain is a pretty straight shot along I-87, but that doesn’t mean it’s not scenic. Taking this road will bring you through Harriman and Blue Mountain State Parks, plus several Hudson Valley towns like Plattekill and Kingston.